where you can show off all of your fun projects featuring THANKSGIVING! Use your wood scraps to make a darling turkey out of 2x4 and popsicle sticks! LOVE IT!!! See it at It's What I Love! 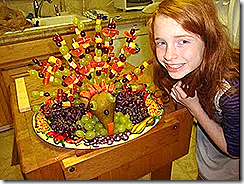 Make this fun turkey using fruit shish kabobs for Thanksgiving dinner with Scene of the Grime. My kids would love this!!!! 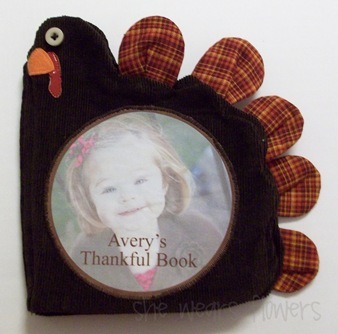 I love this cloth Thankful Book for a child! What an important concept to teach our little ones. Check it out at She Wears Flowers. This burlap Thankful sign is so pretty next to those twine -ified pumpkins. What a pretty display!!! Red Heads Craft More Fun has this one! Please join your crafty post if, and only if, it corresponds with the category and theme of THANKSGIVING. (If it doesn't fit in this category, please link it up to Whatever Goes Wednesday.) 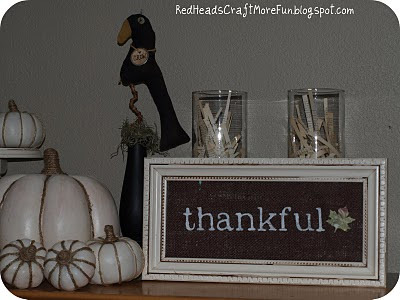 Link up crafts, decor, sewing projects, food, tips, etc, that has to do with THANKSGIVING. If you have joined a THANKSGIVING project to a party on my blog before, feel free to add it to this show too! If you have a lot of turkey projects, please choose your favorites. (Please no more than 4 posts per blog). Link to the specific posts, not to your main blog page. Check back here to see the rest of the TURKEY ideas from the last CC Show- amazing!! Thanks for the cool party! Awesome place you have here. I have had one of your buttons on my sideboard for a while now.